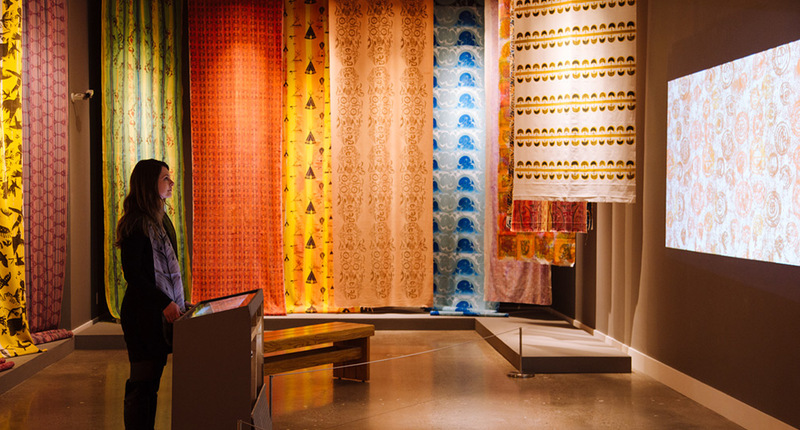 Updated: 3/29/19 - the Exploring Pueblo Pottery project has gone on to receive a prestigious Global Design Merit Award for interactive experiences from SEGD, as well as receiving a 2019 German Design Award, and is the recipient of a Gold 2019 APEX Award in the Experiential Design & Planning category. Ideum’s New Mexico home means that we’re close to one of the nation’s oldest and most vibrant cultures: the Pueblo peoples of the American southwest. 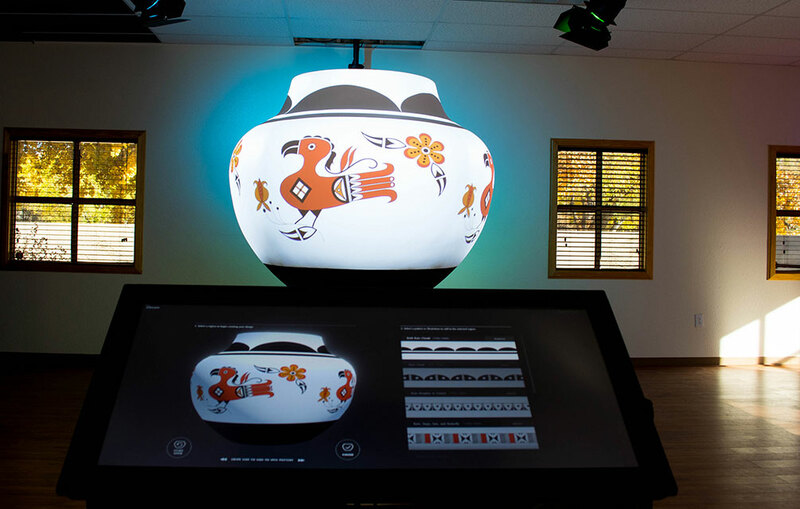 Our new Exploring Pueblo Pottery project uses cutting-edge technology and innovative experience design to shine new light onto ancient motifs. We worked closely with UNM instructor and potter Clarence Cruz and artist Michelle Lowden of Milo Creations to design an experience that allows users to investigate these intricate designs, discover how they highlight important elements of Pueblo life, and learn about the art, history, and culture behind their creation. A sophisticated 360 degree projection mapping system is at the heart of this captivating experience. Users can select from a range of designs crafted by Lowden, an Acoma artist from a family of illustrious potters. 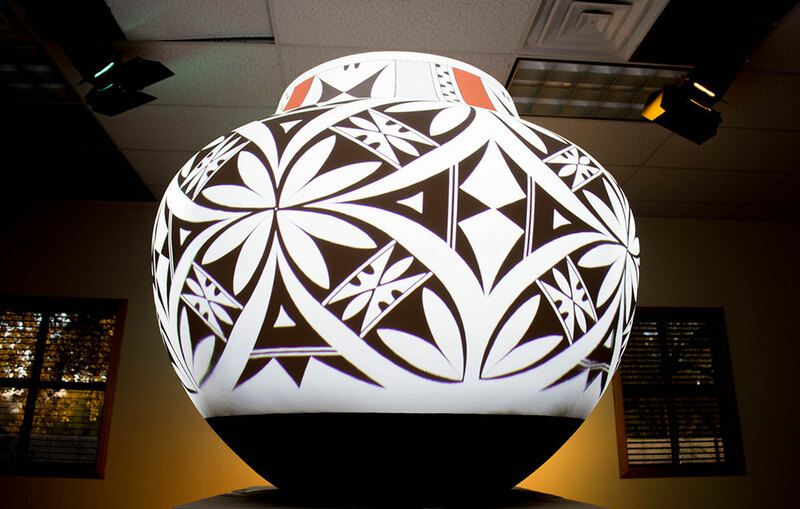 The chosen designs are animated and cast onto a oversized white olla, or water pot, by 4 overhead projectors. Viewers then see the blank pot come to life as stylized images of clouds, rain, lightning, mountains, birds, and local wildflowers envelop the surface of the pot. Although projection mapping has often been used to cast content onto curved surfaces, this project offered the opportunity to push the technology further by projecting particularly intricate moving images on a complexly-curved 360 degree object. Acoma pottery is widely known for the very fine lines and complex geometry used in many designs, particularly in motifs related to rainfall. 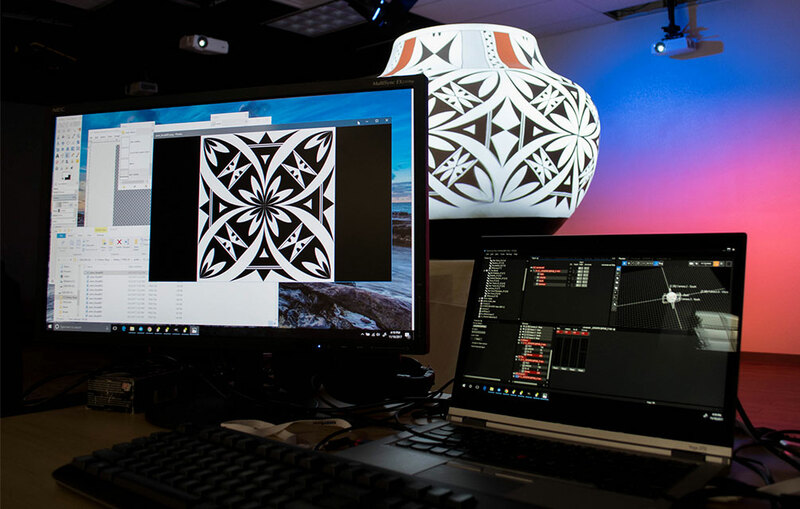 Accurately rendering and integrating these images on the pot’s surface while maintaining their integrity and content required our projection mapping team to achieve new levels of precision with these techniques. 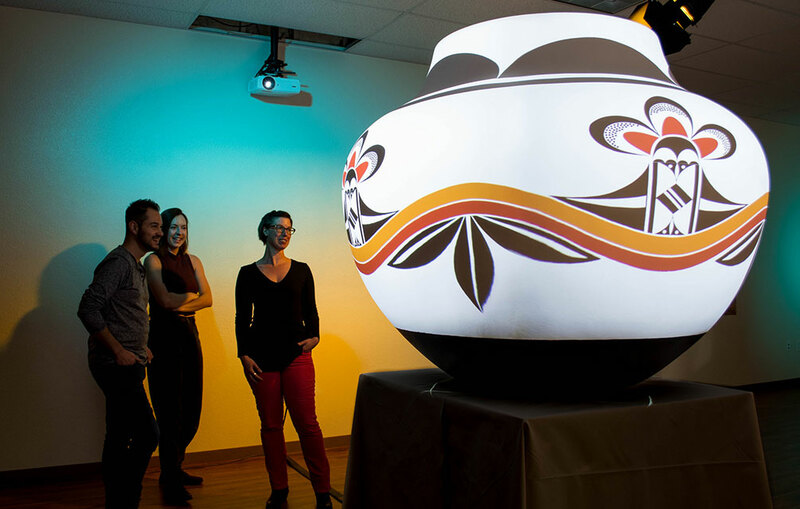 Visitors are active participants as they use a ultra-wide 34” touch display to select patterns and designs that are displayed in real time on the body and neck of the large pot. As they make selections and create new combinations, they learn more about the meaning of the intricate designs. Ideum developed the custom hardware and software on the visitor-controlled kiosk. Christie Digital’s Pandora’s Box was the media server behind the complex warping and projection mapping on the pot. This system also controlled LED lights which dynamically change as different patterns are selected. 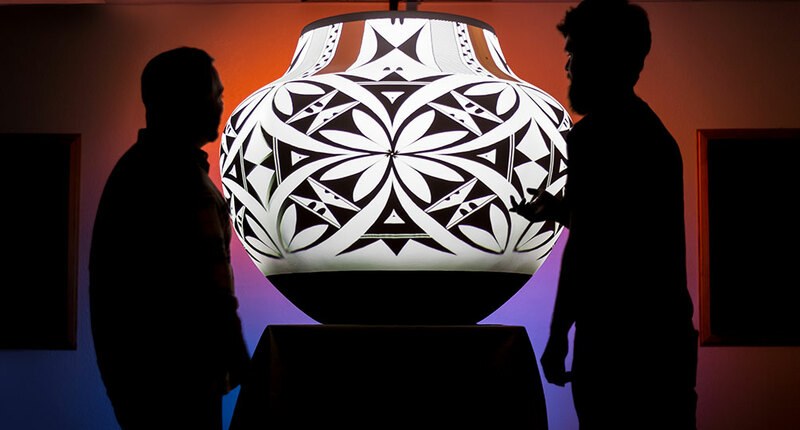 The Exploring Pueblo Pottery project’s success in creating sharp, seamless, and even moving images on an unusual shape breaks new ground in combining techniques and technology—and presents new opportunities to tell stories about the people and ideas behind timeless traditions. 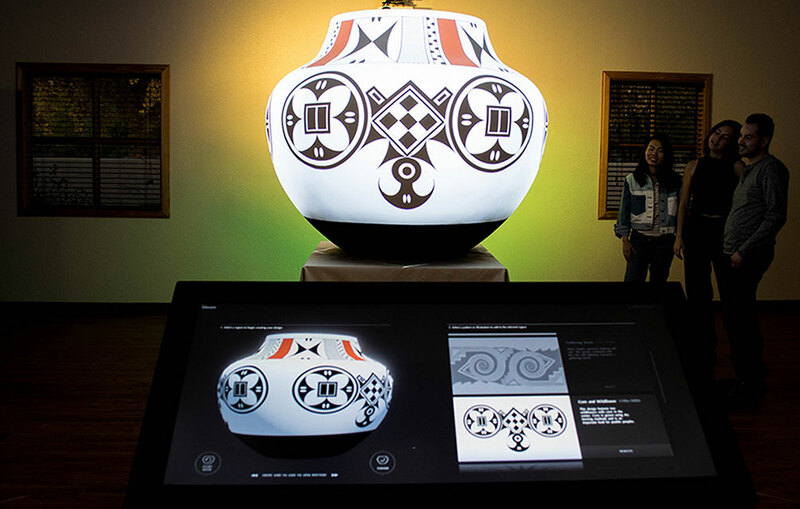 The Exploring Pueblo Pottery project received a prestigious Global Design Award for interactive experiences from SEGD, the Society for Experiential Graphic Design. Out of 353 entries, only 37 projects were selected to receive an award. 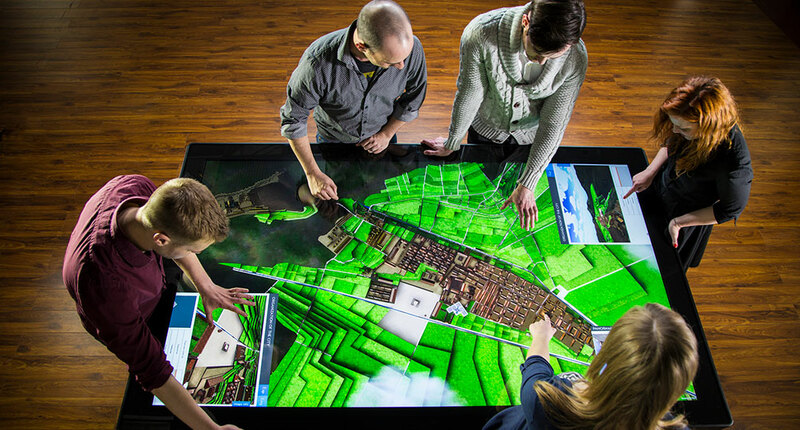 This marks the second consecutive year in which Ideum has won an SEGD award for interactive experiences. The Pottery project is also on the shortlist for The One Show Design Award which will be announced in Spring of 2019.